Cobia | Barbed Steel Charters, Inc. These fish are some of the fastest growing fish in the sea. They have voracious appetites that fuel their growth. They readily take flies and fight hard with lots of stamina. They make many runs and bulldog a lot. Many times they will fool the angler into thinking the fight is over once they get the fish boat side. Sometimes this is where the real battle begins while trying to land them. 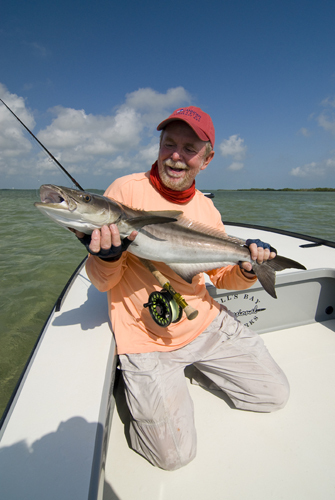 Bringing a “green” cobia into the boat is a big mistake regardless of their size. They have been known to break rods, consoles and anything else they may come in contact with in a boat. Cobia can be found cruising the outside edges of sandbars as they search for their next meal. Quite often to the inexperienced eye, they think that the fish is a small shark due to its blunt head and large pectoral fins. Cobia are notorious for hanging around large sting rays, spotted eagle rays and even manatees. They will patrol for unsuspecting prey that gets flushed out by the rays as they forage along the bottom. If you encounter a cobia in this situation, a well placed cast will more times than not result in a stretched fly line. Cobia run from about 10lbs up to 30lbs with larger specimens sprinkled into the mix. Weight forward floating fly lines will be used in most instances.